ART SERVICES - SCROLL down…..
Visit Elle Fagan's craft page ; Fun - the Fifth Freedom" for craft suggestions, links , instructions. The artist is also skilled in a number of crafts and does work for sale and show and leads groups to share the skills, for a modest fee. Basics in most painting, brush care, some fabric crafts such as knitting and crochet and ethnic crafts for Easter the the Winter Holidays and the Bridal Money Bouquet. Prints and imprinted items - click here to visit Fine Art America, the subcontractors for these services. Some of the images are already there and formatted to print. If your choice of image is not there, just ask to have it set up for the print. They guarantee and are great fun! Commissioned artwork is made to your order and we walk through the process together start to finish. The transaction is not complete until all are pleased. Prices run the gamut, and guarantees apply. Find me with your project ideas. I know I sell fine art, but locally, I also do restorative work with honors. My college teacher in it did work for the White House. I do both 2D and 3D items. I never agree to do the restoration until I can examine it and be sure I am ABLE to do it and for an easy price. NEXT: I check provenance - any special ID belonging to the item. Then I research up the latest in techniques and supplies for the restoration and process. Then I contact the client with an estimate of costs and accept a retainer for the purchase of the supplies to do the work, unless I happen to have them on hand. All this is done before I go to work on your beloved item. For a reason: I found I was restoring A few "Antiques Roadshow" items a few times so far, and the client themselves had no idea. Wow. Do NOT get intimidated: Mostly, I just make like new, lots of beloved items like a Mary statue with dirt and a chip...like new. A dolly, a piece of furniture or table art. A lamp, a torn painting.....stuff like that. I charge about $15 an hour for the work. I used to charge $10, but inflation means I must raise the price a bit. The artist has led classes in fine arts, crafts, care of artwork, cultural enrichment, learning disabled, gifted - adults and children, in corporate, school, business and private events. Affordable - chat or contact to plan. - Groups & "En Plein Air"
Group arts events in watercolor are fine healthy fun as well as opportunities to improve arts skills. The fee is the same , whether the group size is small or larger, so a larger group means a lower fee for each. Contact for Details. Group helps decide the destination and schedule. Brief talk before and critique afterward. Group show is an option, with ads etc., included. En Plein Air is painting as an outdoor excursions - super fun. We agree on a location, time, date, and other details and then make a half-day or day of it. The artist will sometimes help in show project work , paid or volunteer. Organization, funding, setup, decor, crowd management, refreshments, publicity and sales. For many years now. with fine success, I donate my art for you to sell for winnings for your cause or fundraiser. Fun to help - and some of the ArtWith Heart projects are famous. Chat to me with your ideas. I MAKE OUTRIGHT DONATIONS OF MY ARTWORK FOR YOUR FUNDRAISER, CHARITY OR CAUSE. I am lifelong arts, but also used to do response and compassionate and pioneer work and now that I skip the on site response, I donate art outright for full or part benefit per my "Art With Heart" path. DONATION FOR DEDUCTION the "Art with Heart" discount path for your arts purchase: find the painting you like; then donate to your favorite and email a copy of the donation receipt to me. I deduct the amount of the gift from your purchase : up to 50% ! OR - BUY A PAINTING AND GIFT IT - My art not to your taste? That is fine - If you buy one and "PASS IT ON" as gift or donation, you can deduct your purchase price. Art makes a lovely holiday or anytime gift - especially a small work that can be passed on, tastefully, again, to charity for end of year deductions. ARTS CAN HELP ! Get in the spirit and find me with YOUR ideas of more ways use fine art to help any fine cause. 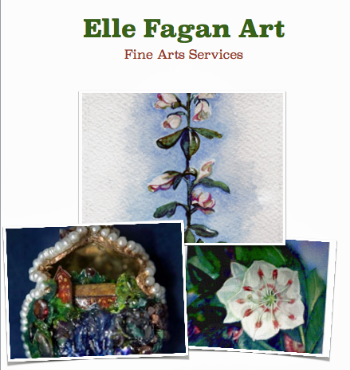 Special: Elle Fagan Art With Heart helps create your event to raise funds. So good to put together an event that helps. Ask me. If my schedule won't allow me to do it, I know others who can. This offer applies to all available images at this site. Money Note: all normal guarantees still apply - repair/restore/replace, but NO REFUNDS on charity items, since the funds are gone to the charity. ~ I hope you agree that this idea is a grand opportunity for all of us to show our best! And now I hope you will want to view Elle Fagan Arts Available Works and make your choice to help. ... and maybe, YOU ? ~ Perhaps ~ if you'd like to be added to this list enjoying art manipulated to win for any good cause. Note: ~ private donations are not mentioned here. I respect donor preference on this point. The transaction is not complete until all are delighted! Art Prints of my work purchased via my Fine Art America sub-contractor are guaranteed by Fine Art America. Artsite Store merchandise purchased via my Zazzle sub-contractor, are guaranteed through Zazzle. New to Fine Arts Ownership ? If you purchase the work framed, it will arrive with hanging hardware appropriate to it, attached. Study the painting from all sides and at every angle.This is the best time to note and correct problems, and get easy answers to questions. Watercolor almost always fades slightly, like patina and aging in other arts media, it is considered part of its beauty. And framing will lighten the color effect as well - which is why I try to finish the work one shade darker than the desired finished hue. This aspect of watercolor is also why it is recommended that the art be hung out of direct sunlight, and away from temperature extremes or dampness. If the art is a recently completed piece, it will appear darker and lighten slightly within the first year. It has been my experience that the colors seem to lighten up to a point and then stop. If, by some chance, the slight lightening develops into serious fading, contact me. Such happenings are rare, and I have made, and am happy to make repairs/corrections, in this rare instance, and your insurance will often cover the additional costs. So be sure to add it to your coverage. The goal of"Elle Fagan Art" is to share a fine arts experience, accessible to many, and more easily than ever, because of the miracle of the internet. All aspects of your visit to my site are important to me. Enjoy the Contact options at the main links. I hope you feel you can visit the site in with pleasure, without purchase pressure and return from time to time to visit the latest work and upgrades here. And I am delighted to share the information here with you. pleasure of owning original art. When you buy my art, you should be able to view the work happily, for a very long time to come, without a qualm, remembering happily, the experience of the sale. The art is yours at purchase: to share it, gift it, or resell it, and get a satisfactory price at resale. Some have purchased the art with the goal of presenting it for gift/fundraising - deductible. I like very much to share viewing of my images online, even after sale. However, if Buyer prefers that the image, once purchased, no longer be viewable to site visitors, this is, of course, possible. Online display distorts the image slightly; not usually all that much. When you receive your artwork, if you are not pleased, think about it, and let me know. This is just a small private arts website to share my art, and I do not collect your data - only what you submit. Your information is NOT shared or sold to any third party. Google collects some general non-personal data for the purpose of tracking and targeting. Again, they do not share this data. I work in arts lifelong - including church and schools as student and teacher - this site is child-safe. Be sure to let me know your preference in sharing your image. Once you purchase an original image it is yours, and you may request that no further sale of prints from you image be done. OR not. Some of the original works are shown in nice shows with the label, "On Loan from the Collection of....." So do tell me if you would like your purchase to be included in a future show. Similarly, if you purchase a completed work I can remove your image from the site, retaining only the copy for my offline copyright files, or I can continue to display the image, marked "sold", and with your name displayed or not, as owner of thepainting. arrange for a conditional purchase, insured. I try to scan and display the work online as it will look when hung.In any event, with unframed artwork from this site, it is recommended to frame the work nicely, and hang out of direct sunlight, away from dampness or other climate extremes. I will repair a damaged work, but I charge a repair fee, unless the damage/error is mine. Insurance often covers such repair needs. This concept is helpful where the historic scenes are concerned, since an error or change in architectural detail may occur and should be spotted and corrected. Again, financial responsibility for the work and time in such a circumstance are judged individually, by commonsense rules, with a goal of grace in mind. Insure the work if loss, theft,damage or repair would make a significant financial impact, so that if conditions I cannot control affect the work, the insurance will pay for repair or replacement, by myself or another artist.